Louis XV acquired the Château de Choisy in 1739. The furniture in the Blue Room (commissioned from the marchand mercier Hébert) was designed to match some blue silk woven by the king's mistress, Madame de Mailly, and to suit her taste for oriental art. Hébert had the commode and encoignure (corner cabinet) for the room made by cabinetmaker Matthieu Criaerd. The commode is a fine example of Criaerd's work. Madame de Mailly's room was elaborately furnished in 1742. Louis XV's mistress had given the king some silk that she had woven; this was made into blue and white striped moiré, and was used in the room which was then painted blue and white. 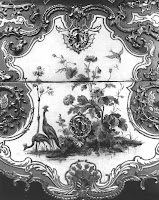 The marchand mercier Hébert and the upholsterer Sallior were given the task of producing the furniture, which was to suit both the colors of the silk and Madame de Mailly's taste for chinoiserie. 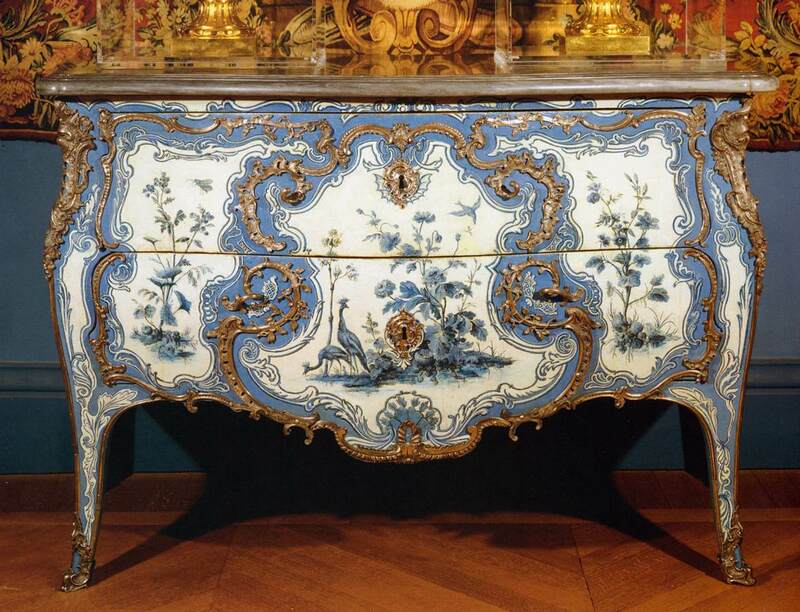 Although the marchand mercier Hébert was entrusted with producing the furniture, a commode veneered with Chinese lacquer was first delivered by his colleague Julliot. Hébert therefore made furniture to match this commode — provisional items, no doubt, which were subsequently replaced by the blue and white furniture which confirms Madame de Mailly's pronounced taste for objects of oriental inspiration, reflected throughout her decorative scheme. Hébert provided blue and white China porcelain for the same apartment, together with silver-plated andirons decorated with figures of Chinese children. Hébert entrusted the production of the blue furniture to cabinetmaker Mattheu Criaerd. Matthieu Criaerd produced a commode and encoignure (corner cabinet) which are now in the Louvre. The commode, with its curved legs and two long drawers, resembles the one delivered to Fontainebleau for Queen Maria Leczinska by BVRB in 1737. It is coated with blue and white vernis Martin, essentially representing exotic birds and plants, freely inspired by Chinese motifs. The silvered bronze decoration, typical of Criaerd, consists of trophies down the sides of the legs, and pierced sabots. The frames are formed by a series of scrolls, and the central, violin-shaped cartouche is created by a wavy border pierced with ovals, scrolls, and foliage. This type of decoration became very popular; it features on other commodes by Criaerd, notably the one in the former Grog-Carven Collection, or the one delivered by Hébert for the Dauphin's study at the Château de Versailles in 1748.